Figures 228 (upper) and 229 (lower) from Chapter 7 (Mitochondria) of 'The Cell, 2nd Ed.' by Don W. Fawcett M.D. 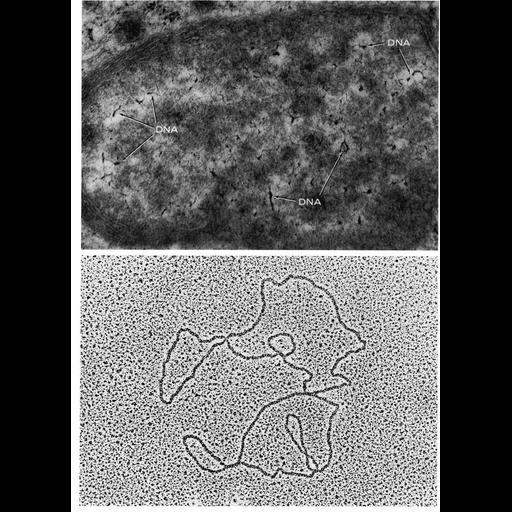 A mitochondrion from rat adrenal tissue grown in vitro shows an unusually high number of DNA filaments (upper). Lower, DNA from disrupted Xenopus laevis oocyte mitochondria. Images by Arvi Kahri (upper) and Igor David (lower). A PDF copy of the accompanying chapter is available on the ASCB’s BioEDUCATE website.